The Enteric Consciousness is an interactive installation focused on our conscious microbiome in each of our stomachs. 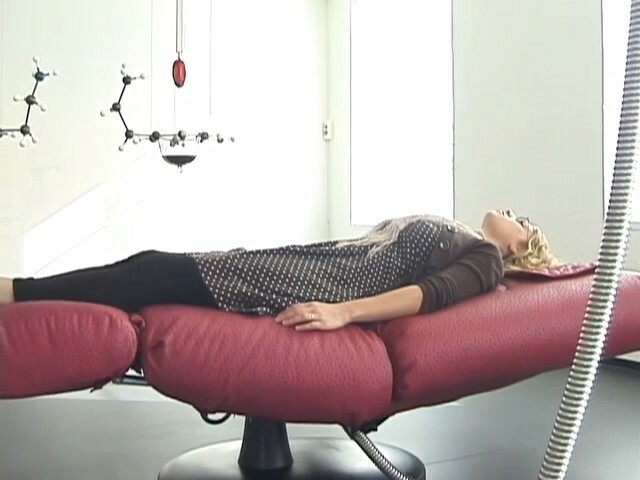 A large glass shaped stomach is filled with the living bacteria (Lactobacillus Acidophilus) and activates a large robotic chair in the shape of a giant tongue. 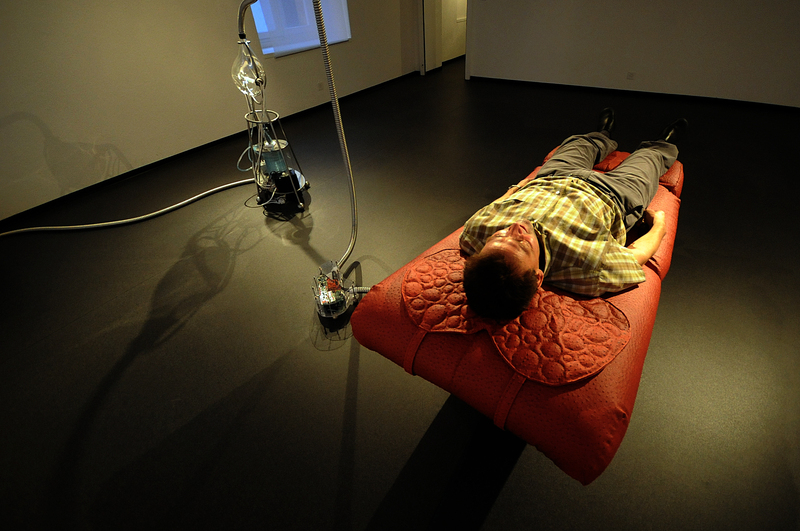 The tongue chair gives you a comforting 15-minute massage, only if the bacterial cultures within the artificial stomach are living. This work explores our sense of touch and corporeal experience with bacterial cultures driving the function of the robot. 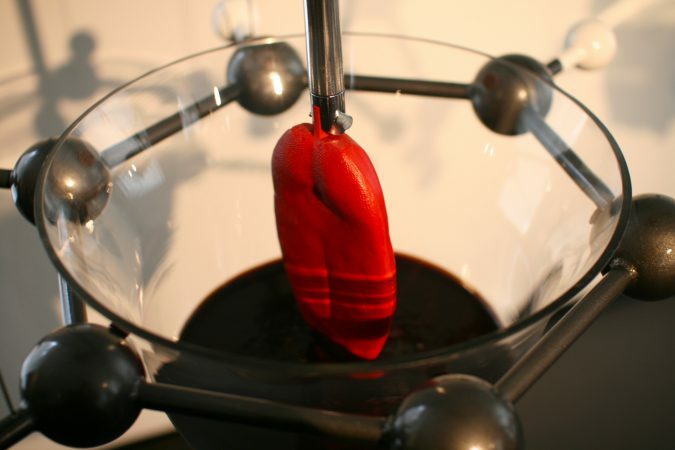 Two robotic tongues also dip into chocolate and cheese pools in glass containers, suspended with steel dopamine molecules. Dopamine mediates the subjective experience of pleasure in humans and chocolate boosts antidepressant serotonin and stimulates secretions of endorphins that create pleasurable sensations in both brain and gut. Electronic peristaltic pumps replicate natural gut action, moving cooling water through the microbiome bacterial cultures in the glass stomach, to keep the bacteria cool, happy and healthy in this symbiotic system. Our own stomachs are considered the enteric nervous system ENS, which is embedded in the lining of our gastrointestinal systems. Our natural stomachs or the enteric nervous system is 1/10 the number of neurons in the human brain and sharing the same neurotransmitters such as dopamine, serotonin, and epinephrine through processing the experience a bit differently than the brain. Our ENS is composed of one hundred million neurons or about one thousandth the number in the human brain. The premiere of Enteric Consciousness by Ken Rinaldo at LA MAISON d’AILLEURS, MUSEUM OF SCIENCE FICTION, UTOPIA & EXTRAORDINARY JOURNEYS Yverdon-les-Bains, Switzerland Sept-Mar 2010-11 commissioned by Patrick Gyger. Photo Joan Avril. If the hand and finger can be seen as extensions of our human brain, then the tongue can be seen of an extension of the enteric nervous system, seeking out what it prefers to ingest. I have chosen in this work to focus on our sense of touch and corporeal experience as a way to explore interactivity, as our largest sense organ is, in fact, our skin. When thinking about interactive art I realized there are relatively few examples where touch is central to the work. Here the touch of the robotic tongue if the activating agent to affect the experience, which is much more visceral and emotional. As peristaltic muscle movements propel food and bacteria through our natural stomachs so an electronic peristaltic pump, will artificially replicate these movements as it moves cooling water, through the artificial glass stomach to keep the bacteria cool and to slow their growth. 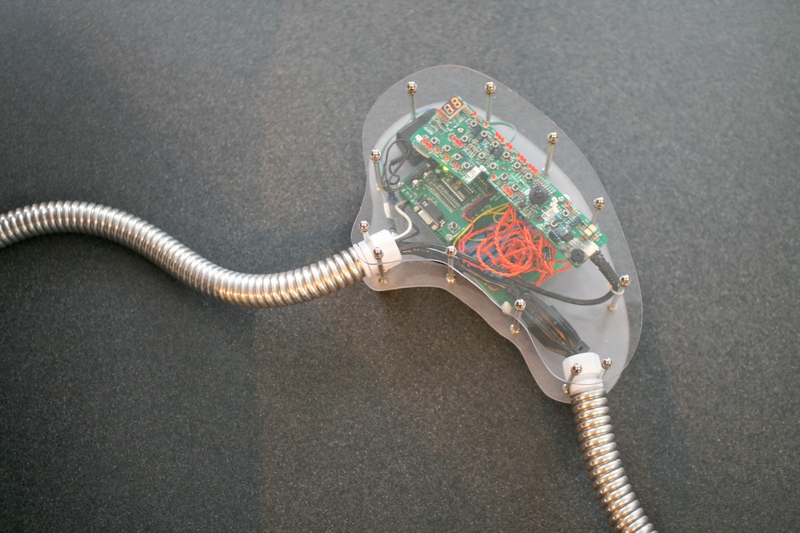 A PH meter will constantly measure acidity and basicity of the bacteria and will monitor the health of the bacteria in the artificial stomach and these signals will be interfaced to and activate a series of relays and micro controllers that will allow the robotic tongue chair to activate, relax and massage the viewer/interactant. 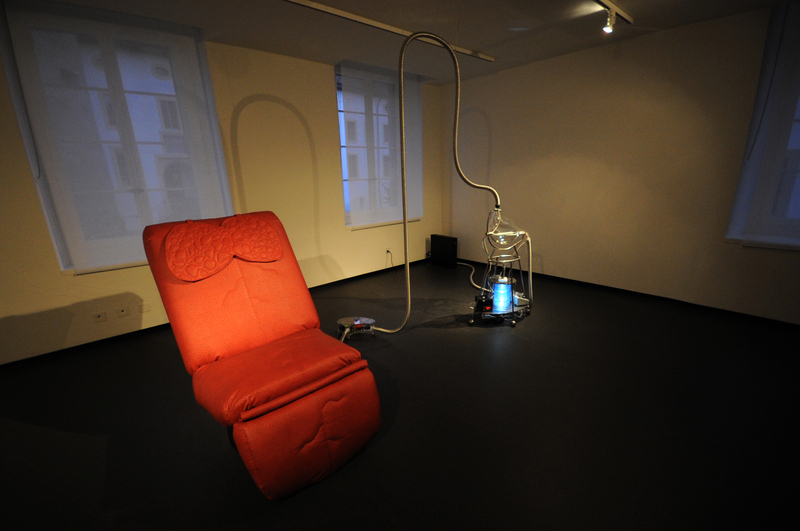 The robotic tongue chair is covered with red emu leather that gives the appearance of swollen taste buds of an enlarged and hungry tongue. While our natural stomachs are sterile at birth they are soon colonized by 1,000s of kinds of bacteria, which mediate and influence what we eat and enjoy. The enteric nervous system and our brains carry on bi-directional communication and share many common neurotransmitters such as dopamine and epinephrine. A scientist has identified a structure called the neural crest in all humans, which forms as an embryo develops. One part of this group of cells in the neural crest evolves into the central nervous system and the other part becomes the enteric nervous system. The enteric nervous system is also influenced by neurotransmitters and hormones and our central nervous system can also affect stomach muscle movements and mucosal functions as well as blood vessels. It is now well accepted that one of the most important jobs of the bacteria in our digestive system is to improve and regulate our immune systems. Acid-loving milk-bacterium Lactobacillus acidophilus, which is a species in the genus Lactobacillus, are the activators of this robotic tongue. L. acidophilus, a species that is involved in fermenting sugars into lactic acid grows readily at a low pH and at room temperature. Lactobacillus acidophilus occurs naturally in human and other animal gastrointestinal tracts in addition to vaginas and mouths. Many strains of L. acidophilus are considered to have probiotic characteristics and some of these are used commercially in the production of yogurt along with other varieties, such as s. salivarius, Lactobacillus delbrueckii, and L. Bulgaricus. 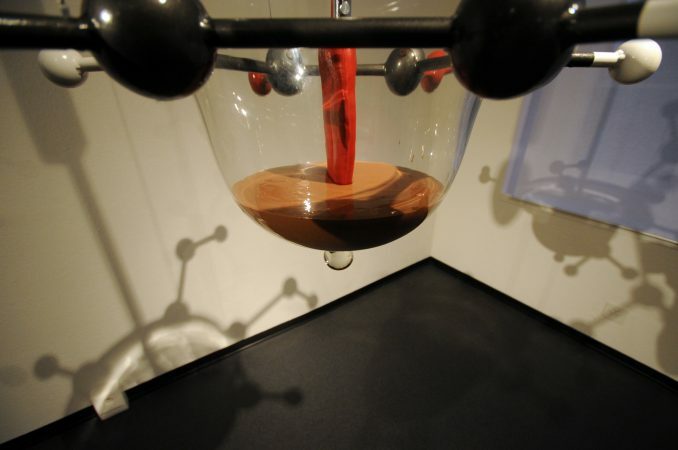 Another element of this installation will be two smaller robotic tongues that will dip into and out of chocolate and cheese pools, located in large glass containers. 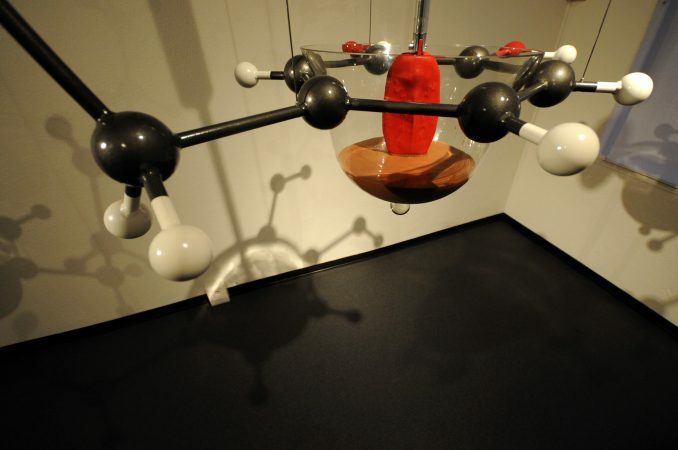 Large dopamine molecules constructed in steel hold up the containers. 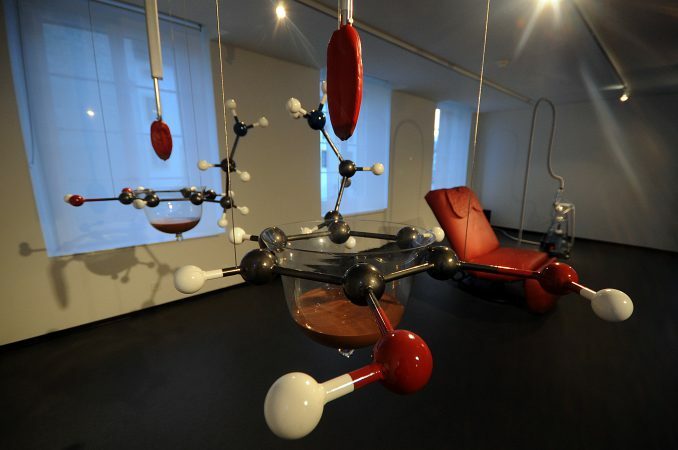 The dopamine molecule is believed to mediate the subjective experience of pleasure in humans and other animals. Chocolate and cheese (sugar and fat) are two substances that both the tongue and the stomach desire. Research has proven that chocolate can boost serotonin an antidepressant molecule and it can also stimulate secretions of endorphins that create pleasurable sensations. 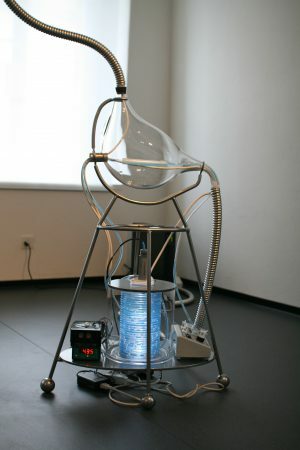 This work is mostly inspired by the notion of the conscious stomach, although it is also inspired by the ideas that humans are not individuals so much as clouds of intertwined human, bacterial, and now machine cells. We have evolved into hybrid symbiotic ecosystems that consist of trillions of living bacteria. Humans have ten times as many bacteria in and on us as we have human cells in our entire human bodies. Our armpits, crotches, and guts are like rainforests teeming with microbial life and our backs are like deserts. The bacteria within and on us are eating and surviving and our bodies provide for their sustenance. There are one thousand trillion (1015) bacterial cells versus one hundred trillion (1014) human cells in each of our bodies, yet the human body does not end there. Bacterial cells are an important part of our health, helping us to digest indigestible foods as well as making essential vitamins and, ultimately, impacting and forming our immune systems. This cloud of cells described above also finds analogs in “machine cells” which are also distributed above and below the earth, where they regulate and feed human society. These machine cells are engineered and self-regulating systems that serve to support human existence. They are networked microprocessors, stoplights, hundreds of trillions of transistors in intelligent devices, and oil, water, and waste elimination subsystems. By looking closely at and thinking about our engineered human existence, we reveal a comfortable proto embryonic sac of chips and wires feeding into larger dendritic networks of 100,000-volt power towers and pulse-coded and frequency-modulated telephony and uplink satellites, all in the regulation of human needs. We cannot imagine the human animal surviving without our now symbiotic relationship with these engineered systems and our coevolved bacterial symbionts that regulate our lives. Just as bacterial cells are autonomous living networks, our robots are now rapidly emerging into proto living systems as they self-regulate, motor around our environment, and begin adopting caretaking roles for humans. The Enteric Consciousness 2010 installation realizes an immersive space celebrating the symbiotic relationship between the bacterial cultures that live in and on us and a now emerging ecosystem of human-engineered robotic entities that will inhabit our homes, our offices, and with nanotechnology, our bodies. ENS consists of some one hundred million neurons,  one thousandth of the number of neurons in the brain, and considerably more than the number of neurons in the spinal cord . The enteric nervous system is embedded in the lining of the gastrointestinal system. SCIART CENTER OF NEW YORK, Feb, 2016 NY, NY. The brains and microcontrollers within the chair were hacked and I added another microcontroller on top of theirs, to allow my programming to control the behavior of the robotic chair through interactive sensors, interfaced to the PH meter, for the health of the bacteria. Controllers for the cooling of the bacteria with peristaltic pumps in the artificial stomach were also embedded microcontrollers, with active infrared sensors, to sense human participants. Each robotic tongue dipping into the chocolate pools was controlled by microcontrollers with passive infrared sensors and linear actuators attached to L298 Motor control boards. Full-size room with no intervening sound or projections. AC 115-220 HZ. Sciart Center NY, Feb 2016 Shows the Enteric Consciousness in Gut Instinct: Art, Design and the Microbiome a virtual exhibition curated by Charissa N. Terranova and Davide R Wessner. Umbigo Magazine, BLOCO Contemporary Art, The Spring Dreams of Ken Rinaldo by Navel, 2013.